BioWare is doing things a little differently with their upcoming online action-RPG Anthem and many are wondering what this new direction means for the developer and their play experience. But it's not just Javelins and fun with friends, the game also offers stunning environments to explore with tons of discoveries to make. It's because of this that BioWare and Dark Horse are teaming up once more to deliver even more adventures within this stunning new universe. With writers Mac Walters (Mass Effect: Foundation) and Alexander Freed (Rogue One: A Star Wars Story) at the helm as the new series' writers alongside artist Eduardo Francisco (Infinite Crisis: Fight for the Multiverse), the newest narrative will follow a young boy named Kismet. 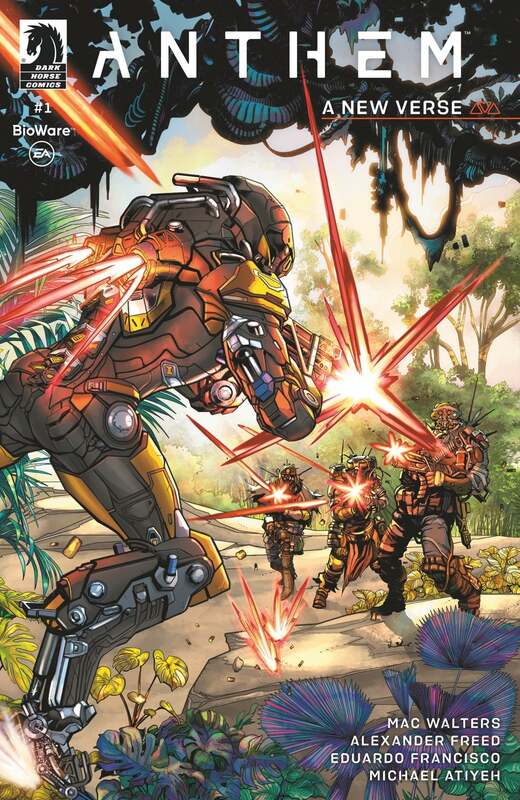 According to the publisher, he was rescued during an ambush by Yarrow, who is one of the Freelancers suited up in those epic javelins seen in-game. Suddenly orphaned, the new comic series will follow both he and his adoptive sister Jani in a fight for a better future both for themselves and humanity. The first issue is set to hit the shelves on February 27, 2019, the perfect time for the newest game from the studio's arrival. The promising new adventure will be available to pre-order at major retailers such as Barnes & Noble, Amazon, and others. You can also scoop it up at your local comic shop as well! "Team with up to three other players in cooperative adventures that reward both combined effort and individual skill. Each player’s choice of Javelin exosuit will shape their contribution and strategic role. As you explore, you will discover a gripping story filled with unique and memorable characters. Seamless and intelligent matchmaking will ensure you can quickly and easily find other players to adventure alongside."